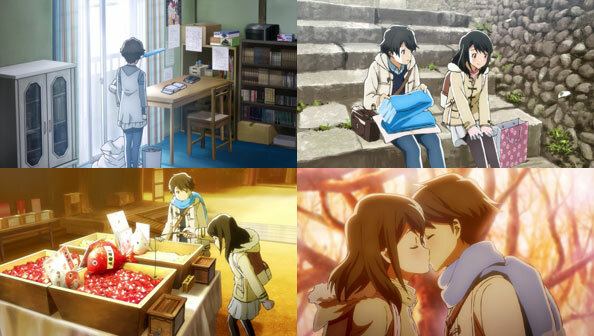 Sooo…this episode was just about perfect, which doesn’t really surprise me at this point. Kotarou and Akane are on splendid terms, so Kotarou faces two new conflicts this week, which prove more complex and challenging than winning Akane’s heart. Gaining the approval of his parents, and being accepted into Koumei. We know Akane’s grades are great and her family is the reason she’s changing schools, so there’s not much tension on her end; just whether or not Kotarou will like her hand-knit scarf (which…DUH of course he will). So instead we delve deep into Kotarou’s small, quiet family, and navigate the treacherous waters with him. Like Kotarou and Akane’s romance, Kotarou’s problems with his folks are portrayed with a heightened sense of realism and equilibrium. His mom may sound worse than nails on a chalkboard when nagging Kotarou, but she’s only nagging because she cares so fiercely about her son’s future. That being said, I don’t decry Kotarou pushing back against the path she’s already laid out in her head for him. It is HIS future, after all. 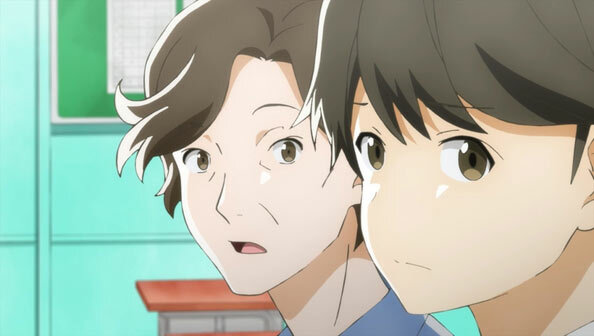 But just as Kotarou was initially so bad at communicating his feelings (or anything else) with Akane, he’s equally bad at explaining why he’s so hellbent on attending Koumei. Hell, he never even seems to try, which works against him early on as his mother quickly dismisses his intention to follow a “girl he likes” as teenage caprice. 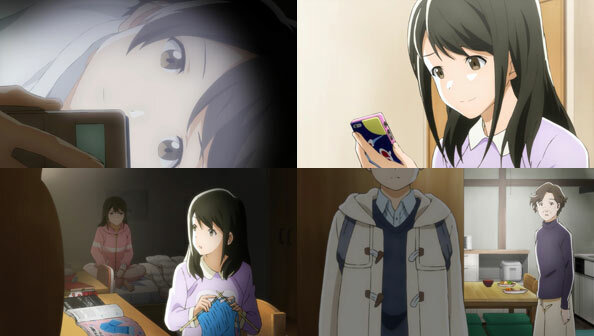 We know better—Kotarou near-as-makes-no-difference loves Akane, and she loves him, but his folks have no choice but to work with the information they have, which is scanty. Rather than hearing it from him, Kotarou’s mother comes to gather more information on her own, as she watches her son furiously studying late into the night. She can tell he’s working hard for something he believes in, so obviously she’s not going to come in and crush his dreams by forcing him into a municipal school. Instead, she adopts a wait-and-see approach, putting her faith in her son by letting him hold the keys to his future. 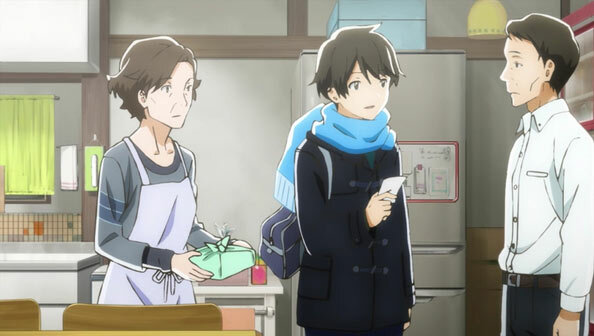 The constant studying wears Kotarou down, and his mock exams are, uh, nothing special, so it’s great to see Akane spearhead a Christmas meetup that serves as a much-needed break for both of them, as well as an opportunity to exchange presents. It’s lovely to watch the couple so comfortable and warm around each other, especially the lack of hesitation when they lean in for another kiss. You really get the feeling, both here and after all we’ve seen, that this isn’t mere puppy love; these kids have a future together…even if they don’t end up in the same school. 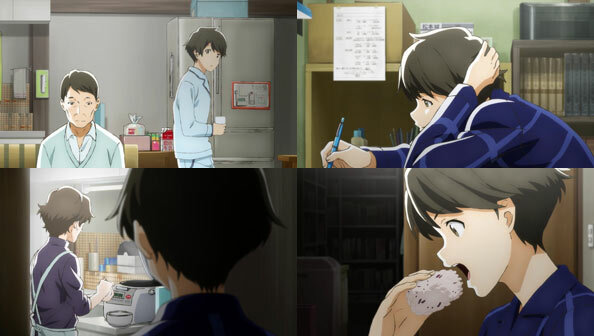 Sure enough, when heading downstairs at 1 am for a snack, Kotarou finds his mother there, making some fresh onigiri; forming the balls with love, care, and gentleness before heading off to bed. His mom is no longer an impediment to his dreams of attending school with Akane. She never was. She saw the effort he was putting in, and decided to support and even fight for him. The morning of his big, decisive exam—the last true impediment to his happiness (though not really since as I said their love seems likely to endure the lengthy but non-permanent distance)—both Kotarou’s mom and dad are up to make sure he has everything he needs, to wish him luck, and to see him off. And Kotarou does something he hadn’t done all episode, but sorely needed to do: he thanks his mom. These family interactions are so understated and relatable, and really form a nice little arc within the episode as understanding is achieved between the parties and the conflict is revealed only as a measure of concern. Kotarou puts in the work to assure them they needn’t worry, and they show him that they are and always will be on his side. Now he just needs to pass that goddamn exam!